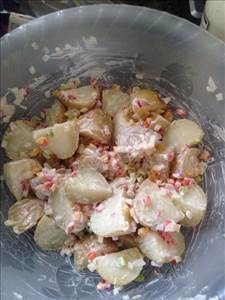 A classic potato salad, a great accompaniment to many meals. Boil potatoes until cooked but still slightly firm. Once potatoes are cooked, remove from heat and allow to cool. While potatoes are cooling, finely chop the radishes, spring onions and capsicum. Put all ingredients into a large mixing/salad bowl and stir through the dressing. 10 members have added this recipe to their cookbook. Light alternative to the traditional dish. There are 292 calories in 1 serving of Potato Salad. Calorie Breakdown: 31% fat, 63% carbs, 6% prot.